Inspiration delivered! Sign up for your free 2017 Monthly Challenges Ebook. Each week the Art Bead Scene features a Designer of the Week. This week's winner is Lisa S. See more pictures of her bracelet here. "What a beautiful bracelet! Lisa's bead choice for this piece is just perfect for our monthly inspiration - those lampwork flowers are so in the spirit of Picasso's painting. My favourite touch, however, is the unexpected dash of red from the lampwork round from Helen Jewellery. It makes this piece stand out from the crowd." Rebecca is a Scottish jewellery designer, currently living in Manchester, England. You can read more about her and her work at her blog, songbeads.blogspot.com and see more of her jewellery at songbead.etsy.com. She also has a supplies shop at thecuriousbeadshop.etsy.com. I totally love this bracelet! 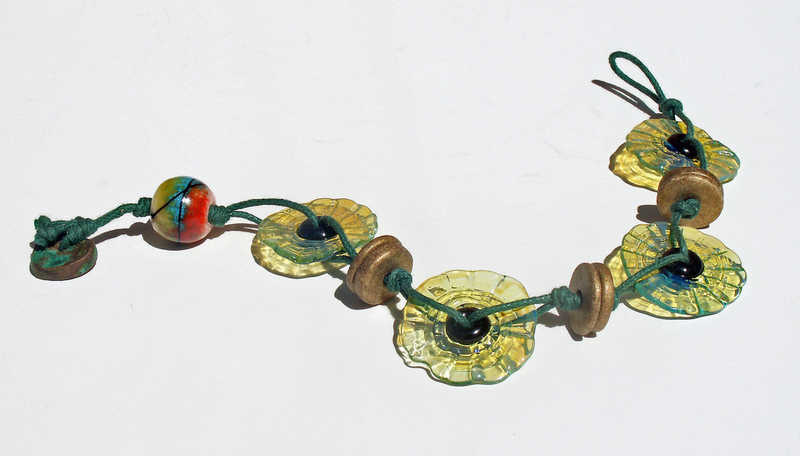 The lampwork flowers are uber cool, but pulling them together with the cording looks magnificent! Featured Designer of the Week - Bee Tree by m.e.